Blog Is Your Hamburger Destroying the Amazon? Is Your Hamburger Destroying the Amazon? Beef is not the most environmentally friendly food, as meats go- but things potentially just got a whole lot worse in August of 2016. This is when the US opened up beef imports from Brazil following an earlier import ban after concerns over Mad Cow Disease in 2012. The Amazon Rainforest in Brazil has been taking a big hit- since 1970, we have lost nearly 20% of the forest (770,000 square km). Vegetarians and meat eaters alike should be paying attention to this one. Why does Brazilian beef impact the rainforest? The Amazon is declining at a rapid rate from all kinds of impacts like logging and soy plantations, but the primary being cattle farming. Brazil currently exports 20% of the world’s beef (in 2016), compared to 12% from the US. 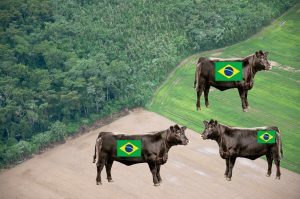 Increasing exports of beef to countries like Russia, Hong Kong, Venezuela, and Egypt are driving demand, and with so many options, Brazil isn’t feeling much pressure. Combine that with powerful soy and cattle lobbies, corruption, and industry-political associations with local and state governments. According to Greenpeace, around 80% of the area deforested in Brazil is now cattle pasture. This is estimated to be the equivalent to the size of Iceland. Thankfully, a lot is being done, both within the country of Brazil and from non-profits and NGOs, but we need to do more. Cutting down on our beef intake is a step in the right direction (cricket protein anyone? ), lowering our overall impact on the planet, But if you do buy beef, find beef from non-rainforest impacting sources. Beef labeling and sourcing remains an issue, along with some confusion among consumers that US Department of Agriculture (USDA) labeled beef is from the US (USDA Choice and USDA Select grades are only inspected by the USDA, not sourced within the US). Instead, look for beef originating from local farms, or from butchers who know. Continuing pressure from the consumer side, as well as supporting non-profits who are working with Brazil to eliminate illegal foresting and grazing, are key to saving (and some day restoring) this amazing resource. Exploitative agricultural deforestation and rainforest destruction can be stopped!